Now that winter break has drawn to a close, it’s time to transition from the cozy comfort of holiday cheer to the productivity and optimism of the new year. As 2018 ended and 2019 began, many of of us probably made classic New Year’s resolutions along the lines of “I’m totally going to go to the fitness center every day!” or “this will be the year I finally go vegan!” It’s also possible that some of us vowed to do something that we’ll actually follow through on. In any case, the key to achieving our goals this time around is to make sure we don’t fall behind, get overwhelmed, and quit halfway through. What better way to make sure that doesn’t happen than to utilize an organization system? It may sound boring and futile to some, but the power of writing things down in an organized manner can completely transform your work ethic. And while it might seem like just another thing to pile onto your collection of new year’s promises, learning to use one of the systems listed below can help everything else fall into place. Once you integrate one of these methods into your life, keeping up will become second nature, which will free up your brain from having to keep track of all your tasks to instead focus on the things you actually want to be doing. Don’t believe us? Try one out for yourself and see if you don’t end up feeling like the second coming of Marie Kondo. This oft-recommended journal system is widely popular for a reason: it’s so well thought out and optimized that there’s no room for you to mess it up. The popularity of bullet journaling also means that there is a wide variety of notebooks available that are set up for the system, though it’s straightforward enough that a proprietary notebook isn’t really necessary. Bullet journaling is based on the simple concept of creating bulleted lists. By organizing everything into a list with separate types of bullet points to dictate different types of list items, you can easily keep track of exactly what you have to do and how important each item is. 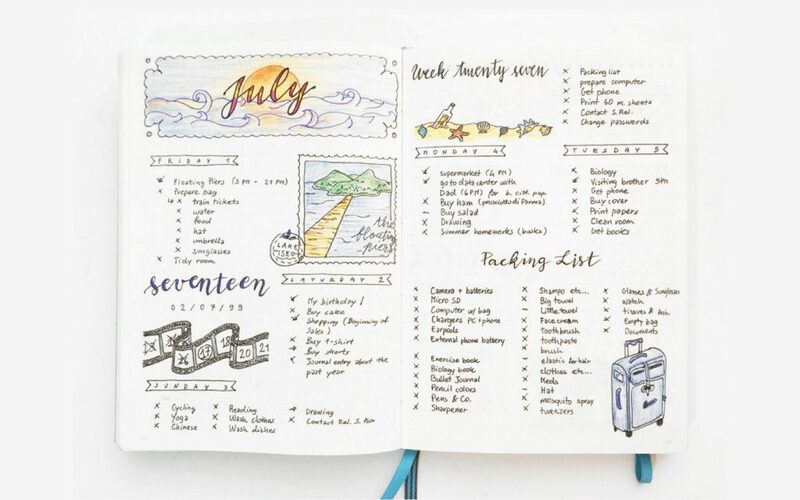 Bullet journaling is an all-encompassing method for keeping track of your life, so we’d recommend it for anyone who’s looking down the barrel of an especially busy year and wants to makes sure they don’t miss a thing. And if you’re the kind of person who gets excited buying stationary and school supplies, you’ll be happy to know that there’s a wide variety of attractive bullet journal choices out there for you to get your hands on. Read more about the bullet journaling process here. Looking for something less rigid? The Getting Things Done method, or GTD for short, uses a similar list-making process as bullet journaling, but without all those darn rules. GTD focuses on organizing the way you keep track of your tasks so you can focus your energy on getting them done, rather than wasting time worrying about what you have to do next. GTD users accomplish this through the system’s five pillars: capture (the process of collecting information about all your to-dos), clarify (breaking those tasks down into actionable steps), organize (by category and priority), reflect (looking things over and deciding what your next steps should be), and engage (actually getting things done). While GTD is much simpler and less restrictive than bullet journaling, it can be a little vague. So, we’d recommend this system for students who prefer to go about things in their own way. For more info on GTD, watch this video. Strikethru combines the convenient thought-out-for-you aspects of bullet journaling with the comfortable flexibility of GTD. It consists of three basic parts: the live list, the dump, and the vault. The live list is the “to-do today” list, where you keep track of what needs to be done on a daily basis, and nothing more. The live list is the list your work off of, and since it’s not cluttered with all the stuff you don’t need to be thinking about in the present moment, you’re free to get things done without ever feeling bogged down. Things that don’t belong on the live list, such as stuff that needs to be taken care of within the next week or month, belongs in the vault. Strikethru’s creator defines the vault as a place to put everything else that could be organized into lists, while the dump is a free-form space for brainstorming. The live list is put together each day with things from the vault and the dump, allowing you to focus only on the tasks at hand. Read more about the strikethru method here.